The Bothell City Hall, a 51,000 square foot office building, was recently certified as LEED Gold. The environmental standard is the second highest designation for buildings that are designed to lessen the burden on the environment. Financed by the National Development Council, the building houses essential city functions, and a conference center. It provides underground public parking and was the beginning of Bothell’s resurgence in recent years. NDC issued Lease Revenue Bonds in 2014 and continues to provide asset management services to ensure the building continues to operate effectively and in compliance with the tax exempt requirements of the 63-20 public infrastructure program. The building was completed in 2015 and was developed by Vulcan. GLY was the contractor, and the architect was Mike Jobes of Miller Hull. 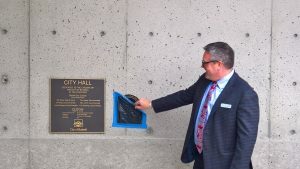 The building came in under budget at $40 million, and the remaining proceeds were used to pay off principal on some of the bonds to reduce the debt burden of the City.